I know that lately I embrace the vivid colors combination in my outfits, so I decided to make a radical switch. Pastels are always a great alternative, no matter the season and Jil Sander gives us the perfect example in F/W collection, where pale pink looks better that ever in the Winter season. I was happy to approach this delicate palette a few days ago, and here is the result! Grey jeans and ankle boots, pale lilac shirt, covered up with this wonderful pink -antique wool coat (found it in a vintage shop). From the same vintage shop, I bought these rhinestone necklaces, back in the Summer, and wore it for the first time now. Fabulous bag and coat! Such a great color combination! Love this coat and love the pastels together. 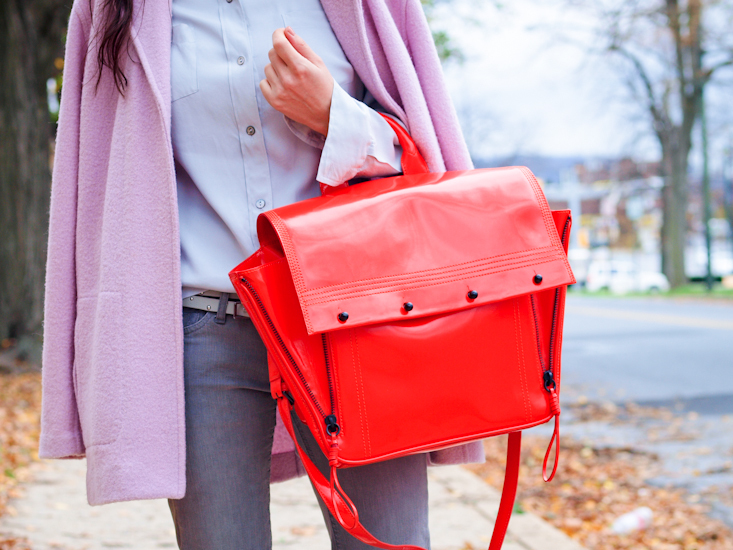 That pop of red with the bag is perfect! I love that bag, really perfect! Those different pastel colors look like they belong to be combined together! Adorable outfit! Really love the coat, amazing color! Nice combo with the grey! Looking gorgeous! you do it great with colours! Super cute! Love the zipper at the bottom of the jeans!!! Oh! I love your coat!! It’s such a beautiful color! Brilliant coat! I just feel that the bright red bag is somewhat out of place. Bittersweet are those colors. I adore this outfit. How the bag fits into the whole scene. the colours of this look are really wonderful! I love how this look evokes something “cold” and dynamic and yet the powdery grey shades give out a melancholic frailty! You are the master of combinations indeed my lovely Veronica!